Bob Ruffolo from IMPACT shares how he stopped churning customers and employees and built a growth machine with the help of every team member. In 10 years, Bob Ruffolo has gone from a fresh-faced college grad who nobody would hire to the leader of a $5+ million marketing agency. Well, that isn’t totally true. One company did hire him out of college: Component Engineers. But even his boss at Component Engineers could not have anticipated how quickly he would improve the company’s marketing results. His boss probably didn’t anticipate that he’d go on to build a thriving business of his own either. Like most entrepreneurs, Ruffolo’s rise from one-man agency to 42-employee company was full of bumps and bruises. But, unlike many others who fail to scale due to personal or organizational limitations, Ruffolo and his first partner, Tom DiScipio have been able to address issues over the years by placing an emphasis on building processes and high performing teams. Turns out, of course, Ruffolo was just getting started. And while he and I have frequently talked over the years, I hadn’t heard the whole story. So, the other day, I interviewed him to get a more complete picture of the rapid growth of IMPACT, and specifically, how he designed a company that kept both employees and customers happy. If you aren’t already familiar, IMPACT is a 42 person firm based in Wallingford, Connecticut. They currently have 50+ clients on retainer, throw marketing events like IMPACT Live and manage the well-known-to-the-inbound-marketing-crowd IMPACT blog, with over 400,000 monthly visitors. 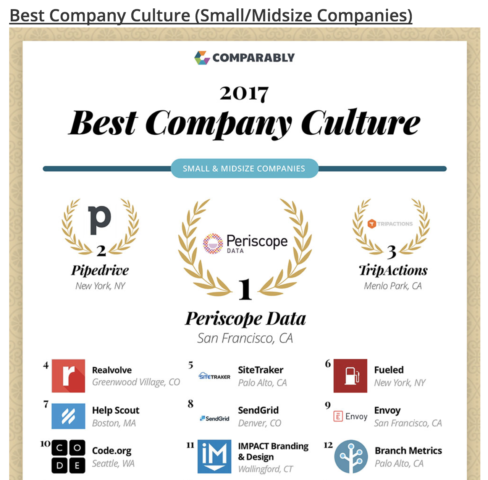 They are a HubSpot Diamond Partner and Databox Premiere Partner too. This is an especially pivotal moment for IMPACT as they aim to scale from a marketing service provider to a full-blown services, education and media company in 2018. All their lessons learned over the years will surely be tested as they launch new services and continue to grow revenue from their existing services. When I joined Databox last year, one of my first calls was to Ruffolo. He saw the value of Databox right away as a way to take their agile marketing processes to the next level, but was in the middle of some organizational changes and didn’t have someone to lead the implementation of Databox. After a few months of hounding him, he finally dedicated some resources to learning and using Databox. That was about the same time as one of our earliest power users, Quintain marketing merged with IMPACT. Together, Stacy Willis (formerly from Quintain) and Brie Rangel (Director of Accounts, IMPACT) quickly leveraged Databox to roll out automated reporting for every client and then, trained every one of their account managers to use it effectively in their monthly reporting meetings. Once again, Ruffolo proved that he and his team can get stuff done. If you want to hear the full behind the scenes story of how IMPACT hits aggressive goals for themselves and clients, join me and Brie Rangel, IMPACT’s Director of Client Services on Tuesday, January 16. IMPACT will share how they doubled their business in 2017 and more importantly, drove stellar results for clients. You’ll learn how they adopted a new goal-setting strategy that gives employees clear direction and purpose for their work and gives clients better results. Don’t want to wait? Keep reading to learn more of IMPACT’s growth story. After interviewing Ruffolo for 2 hours the other day, I discovered there are at least 9 things that IMPACT does very well that I believe have contributed to their success over the years. Over the years, Ruffolo has now learned better. He saw, first-hand, how a company vision can transform employee morale and the quality of their work. But he had to learn the lesson a few times over before he finally made this a priority. At first, in 2009, the vision was simply to become the top marketing service provider in the Wallingford area. But Ruffolo didn’t lead with this vision or share it with anyone. In fact, when his now-partner, Tom DiScipio, applied for a job through Craigslist and was eager to join him after the interview, he was very surprised. “I was shocked when I learned that Tom was willing to leave his job with a nice salary and benefits to come work with me for an hourly wage that was not a whole lot more than minimum wage is now. But, he said he ‘saw the vision’ for the company and he wanted to be a part of it,” Ruffolo recounted. After about a year or so of effort, Ruffolo achieved the goal of becoming the top marketing agency in the area. They were able to move the office out of Ruffolo’s condo and into office space with a small band of employees. However, once they hit this goal, he ran into new issues. Even though he may have been the top agency locally, his model was completely unscalable. He was not able to retain clients because they weren’t able to easily produce the results clients expected from the projects they were doing. Therefore, he was constantly hunting for new project-based work. And because of the resulting inconsistent cash-flow, he could only afford employees that were straight out of college and had little to no marketing experience. Plus, everyone was working too much and getting burned out. He didn’t know what he didn’t know at the time, but having a project-based business run by mostly inexperienced employees proved a bad way to build a business. The problems came to a head at the end of 2011. He knew that he needed a different model. He believed that HubSpot could help him better deliver and prove client ROI. (He had been following them and learning from them from his time at his first job.) So, he started learning about HubSpot’s agency program. Once he realized it could help him, he essentially stopped selling and executing work for two-months to re-educate the team on inbound marketing principles, HubSpot’s software and HubSpot’s retainer sales process for agencies. In early 2012, they launched their inbound retainer packages. As I uncovered and shared when I interviewed him in 2012, they closed 5 new retainers in the first 6 months. The recurring revenue allowed them to stabilize cash-flow. Of course, that vision quickly proved to be unrealistic, so they set a new one, the third vision in the company’s history: to become a Diamond Partner in the HubSpot Agency Program (the highest tier), which had a few hundred agency partners at the time. 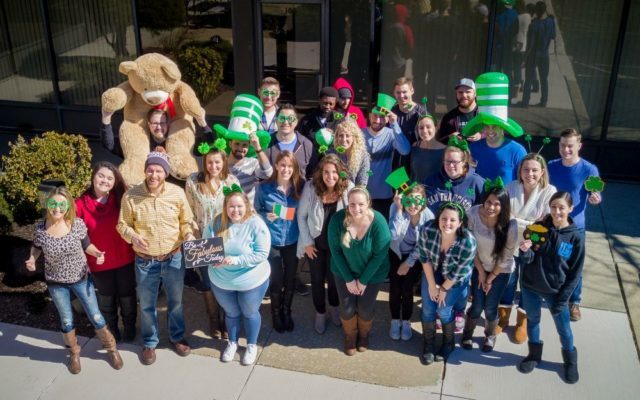 Ruffolo knew that yet again, his agency was in an unsustainable position, so he set a new goal with input from the whole team: become Partner of the Year within the HubSpot Agency Program and win a Best Place to Work award. To do that, he doubled down on improving his leadership abilities. By the end of 2017, they had accomplished this goal too. Ruffolo has never been satisfied with his success to date. But, it took him quite a few years to understand that he had to cultivate a team that was also invested in always setting bigger and bigger goals. To do that, he could not get away with just trying to improve every single month or every single quarter. He needed to share his vision with them and earn their allegiance. Otherwise, he knows he would have been stuck with a revolving door of employees and customers. Sometimes, SMART goals are not the best move for your company. Instead, you need a stretch goal — an ambitious goal that may seem unachievable. As you can see, the team fell short by quite a bit. But Ruffolo does not consider that a “failure” since they learned a lot. Based on their experimentation, he knows better how to accelerate their path to 5000 subscribers. By setting a SMART goal, his team was pushed to try new things and learn and now they are better prepared to hit the goal going into 2018. 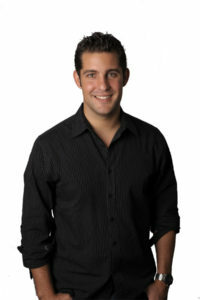 Ruffolo learned the value of inbound marketing early in his career and well before starting IMPACT. His first job out of college was to improve the performance of a manufacturing company’s website. It was only getting a few hundred visitors per month, with no clear leads generated or deals created. Keep in mind, this was 2007. There were few resources that covered digital marketing. Ruffolo diligently read the HubSpot blog and created content, optimized for keywords and more. By the end of the year, the site received about 200 visitors per day, a 30x improvement over past performance. Ruffolo felt great about his work, but his boss was not equally thrilled. His boss did not understand how these visitors would translate to sales. Ruffolo needed to adjust his approach since increases in traffic alone weren’t going to help him keep his job. This made all the traffic generation effort worth it. His boss started mentioning his name to other local businesses in town, and soon, he had multiple requests for freelance marketing help. He was able to quit his job in 2009 and become self-employed. You might think that Ruffolo learned his lesson, but he had not. The traffic vs revenue generation issue reared its ugly head again in 2011, when he failed to prove the impact of his services to client’s top line. But, after he transitioned to using HubSpot in 2012, he was able to much more easily track his impact and communicate the value of his services to clients. Today, they’re still improving their ability to prove the value of their services; to show that the work they do generates revenue. IMPACT may have had an internal commitment to deliver value to clients since 2012, but until 2017, they were not satisfied with the way they communicated it to them. Clients would still remain unsure of their value, even when the IMPACT account manager was excited to share the exceptionally positive results. So, when Rangel and Willis began implementing Databox, they knew they had to improve their team’s ability to set, track, hit and communicate goals with clients. So, they asked their sales coach, Jack Carroll, to take on a new project to train their account strategists on how to better share results with clients. Account strategists need to be able to handle different types of situations. Clients may not know nearly as much about digital marketing as an IMPACT employee, so it is the account strategists obligation to find a way to explain the latest month’s results in an understandable way. Just because they had created positive business impact does not mean that the client would understand why or how, or even how much. Also, when the results are not satisfactory for a given month, the IMPACT strategists need to know how to broach the subject, set new goals and reset client expectations for future months. In early 2012, IMPACT had just begun offering inbound marketing services. They were ready for the new model, but inbound marketing was still a new concept and they had no reputation outside of their direct surroundings in Connecticut. That is also when John Bonini (now Director of Marketing at Databox after a stint at another local software company, Litmus.) believed his time would be better spent on marketing the IMPACT business rather than working with clients. Ruffolo let him try it out, and John wrote content full-time for the IMPACT blog. After a few months, Ruffolo realized that they were ahead of the market, and decided to pour more resources into building organic traffic. “I hired freelancers to help us create a massive amount of content. We were publishing three articles a day, which was equal to the output of HubSpot, a much larger and well-capitalized company,” Ruffolo shared. Although organic traffic accumulates over time, the massive output of content grabbed the attention of many of the other agencies in the HubSpot ecosystem. At the time, I was running the HubSpot Partner Program, and because of their commitment and the results they were getting, decided to make IMPACT one of the partners I’d use as an example in talks and in content we wrote. 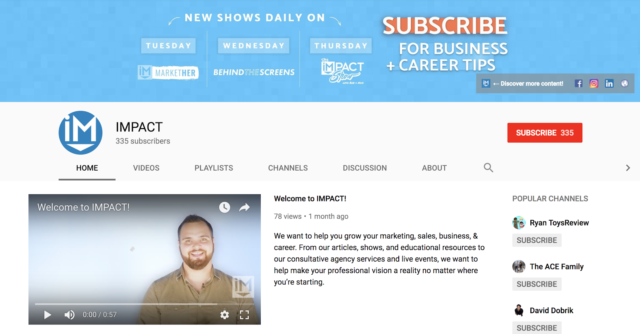 Because of all of the great things that have happened because of it, IMPACT continues their commitment to content through today. They have grown traffic to 400,000 monthly views, a staggering number for a 42 person company in a crowded market. At a time when the rest of the market is competing using the same tactics, their strong domain authority makes it easier for them to stay ahead of the competition. By being constantly top of mind for potential customers, Ruffolo has escaped a normally competitive game. Now, his brand has an advantage over others in the space. He can also sell other services to this massive audience. He can attract sponsored content for his blog, and create events like IMPACT Live with high expectations because so many marketers know about the IMPACT brand and subscribe to their newsletter. I’ve spoken at both of their annual events since it’s just a quick drive for me. But, last year, many agency owners flew out to the event just to see Ruffolo, meet his team and learn how he pulls it off. 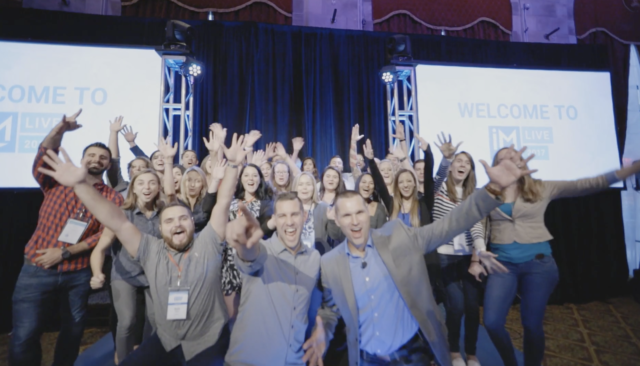 This community has also allowed them to launch their new educational products and with the merger of The Sales Lion (TSL), they’ll be able to leverage the IMPACT reach to sell the HubSpot Intensive and Video Marketing workshops TSL has developed. By being exceptionally effective at one type of marketing for years, Ruffolo has been able to launch many new services. But he would have never gotten there if he was only thinking about how he was going to hit his numbers next month or next quarter. He made a long-term commitment to building a brand through content. In the early years of IMPACT, Ruffolo did not share his vision with his employees. He also did not have a specific hiring strategy. He focused on growing revenue quarter over quarter and ended up hiring a lot of people just to do the work he secured. Many of his early employees were just looking for something to put on their resume before they moved on. This wasn’t necessarily each employees fault. Ruffolo was not recruiting people to fulfill a vision, and so employees mirrored that back to him by not being very committed to him or his vision. In 2015, it fell apart. They started the year with 36 employees and ended the year at 23. Employee attrition was constant. The agency was losing $25,000 a month. But this was also the year that Ruffolo figured out how to build a vision alongside his team. Natalie Davis, Director of Talent, and Ruffolo began working hard to change the culture. They surveyed employees to learn what they wanted IMPACT to be. He began doing town-hall-style meetings every month to make sure employees had a chance to share their opinions. And he finally got serious about creating and communicating a vision. He creates 3-year visions, and tries to describe every detail of what IMPACT will look like 3 years into the future. This vision also extends to the types of employees they look to hire. The 23 employees from the end of 2015 all stayed on for at least another full year. Every employee has earned a higher salary, and they became more intentional about hiring in the future. 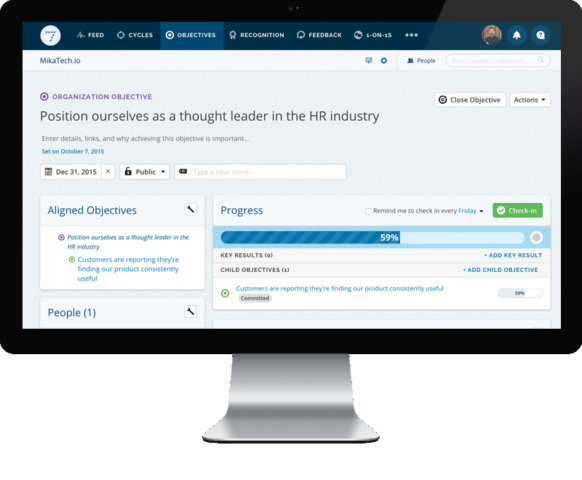 In 2016, they implemented a system of Objectives and Key Results, or OKRs, for each department. This means that each department has a high-level objective that guides their actions. For example, the goal for the Talent division is to keep on being a Best Place to Work. After they set the high-level objective, they create a few “key results” that can help them measure progress to that goal. For example, Best Place to Work is measured based on employee attrition and the results of the NPS surveys they run within the office. They use a tool called 7Geese to keep the entire team apprised of progress towards OKRs. Each team has quarterly goals. If one team seems to be falling short of their goal, another team will notice and can jump in to help. This process helps IMPACT connect the lofty visions they set with the month-to-month activity of every employee. As Ruffolo learned early on, delivering value is key to keeping clients around. Unlike many agencies, IMPACT stays focused on delivering real results to clients, instead of executing a constant set of services. They work collaboratively with the client’s marketing team, rather than seeing themselves as an outsourced service provider. This collaborative approach also affects the way they think about renewals. Sometimes, even though they might do great work for a client, they know it would be best for the client to spend the money on other places in their business. So, they do not stress about losing clients for this reason. They do stress about clients that rate them as DNME- Did Not Meet Expectations in NPS surveys. This is what they look to minimize. If they feel like they do not have a great way to deliver results, they are also comfortable talking with the client about it upfront. In 2013, IMPACT started using a 10-metric scorecard for all clients. They tracked the typical metrics- social following, traffic, leads, MQLs etc. Account strategists would fill in the scorecard for every client once a month, and then see whether they hit the monthly goal. But in 2017, they realized that they could no longer afford to manually fill in a spreadsheet. It gave them no opportunity to react to changes in the data. They learned about issues right before their monthly meeting! 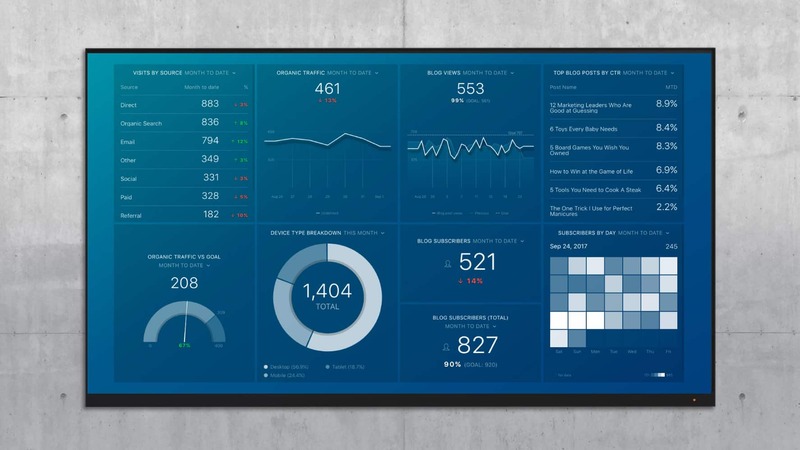 They switched to a system called the Value Journey Canvas to determine which metrics were important to track, and they started using Databox to automatically track data without touching a spreadsheet or Powerpoint. Here is the Attract dashboard from the Value Journey Canvas. They use a pod system to keep all members of the client services team accountable. Brie Rangel runs the client services team, and they organize accounts into groups of six to seven people, called “pods”. “Each client has a dedicated Strategist, who sets the direction of how to accomplish results and manages the day-to-day operations of executing the work. A Principal Strategist oversees overall metrics and success criteria for all clients in the pod, checking in as needed, as well as manages each team member. 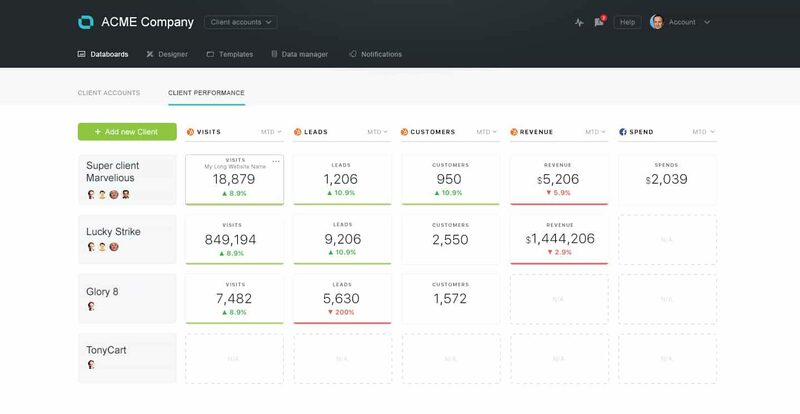 Using Databox, every level of the account team can easily access the appropriate data for their accounts at any given time including the key numbers, historical performance trends and progress to goals. Remember back in 2012 when IMPACT got ahead of the market by growing their blog? They’re still ahead. Their huge blog following and email list allows them to market new services they create or add. With their recent merger with The Sales Lion, they are now prepared to start a whole new arm of the company- educational content. This content will be delivered via workshops, video and live events. They’ll also be adding specialists to their team who can deliver new services to existing clients. IMPACT’s story demonstrates that growing and owning your audience is a strategy that will pay off again and again. Expanding services is always easier when you have a built in client-base and audience who will be interested in what you launch. IMPACT has no technical advantage over their competition. They do not have employees with thousands of years of combined marketing experience. To achieve the success they’ve achieved, they didn’t have to invent anything on their own. And they certainly have not been more “lucky” than average. So how did they get ahead of all the similar looking-competitors in their industry? Why has IMPACT been successful despite years of difficult issues around client and employee retention? Ruffolo did have the early foresight to get involved with inbound marketing with HubSpot pretty early-on, and he joined the Databox partner program pretty early too. In fact, he’s great at picking winners and going all-in. But these aren’t shortcuts and they are available to anyone willing to put in the hard work. The answer, in my opinion, is that they always set aggressive sometimes-crazy goals, make sure everyone on the team is onboard, and they work hard towards hitting them. It’s a relatively simple formula that Ruffolo arguably learned the hard way. But, once they did learn the wrong way, they implemented systems that got employees involved in the future of the business and more motivated to hit ambitious goals every year. As a result, their annual run rate has hit $5M for the first time ever. It’s also clear that the IMPACT story isn’t fully written yet. I’ve been fortunate to see them grow for the last five years and I’m excited to see what’s in store in the next five too. With the assets and team they’ve built, they have a range of opportunities available to them for expanding their business and providing more value to their existing clients. Want to hear exactly what they are doing and how they are doing it? Tune into the webinar.